Raise your hand if you know what a 'keener' is. 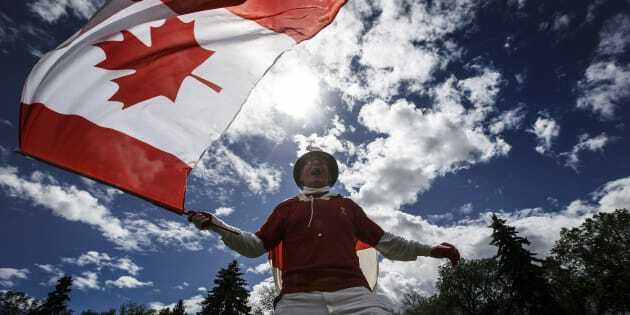 Henry Stephens celebrates Canada day in Edmonton Alta, on July 1, 2018. If someone tells you to "fill your boots," do you know what that means? What about if someone responds to a point you made with an enthusiastic "Yes, b'y"? And what on God's green earth could a "bunnyhug" possibly be? Seems like folks in the Yukon, Newfoundland and Alberta respectively are wondering those same things: those are the most-searched Canadian slang terms in those provinces. Canada is geographically massive and linguistically specific, as anyone from Quebec who's lived in Ontario for three years but still runs to the "dep" and not the "corner store" can tell you (I'm trying to curb the habit, I swear). Each province and territory has its own vernacular, its own slang that is often unknown to outsiders. Thus, in honour of Canada Day, Google Trends took a look at the most frequently-searched Canadian slang by province or territory. Take a look at the results below. The most-searched term isn't necessarily the most-used, explained Nicole Bell, a trends expert from Google Canada. Sometimes it's an expression that's rarely used that people are trying to figure out. "When people are going to Google to search something, it's usually because they're looking to learn more, to understand something or to have a question answered," she told HuffPost Canada. One example: the mysterious "bunnyhug." "What I think surprised me the most was that the word 'bunnyhug' was searched in Alberta," Bell said of the trend map. As this deep dive by the National Post explains, "bunnyhug" is Saskatchewan slang for a hooded sweatshirt without a zipper but with front pockets stitched in. "If we were talking about where people post on Twitter about 'bunnyhug,' we'd probably see that in Saskatchewan — it's such a regional term." Bell said. Of its prevalence in Saskatchewan's western neighbour, Bell hypothesizes that "I think this is people in Alberta ... doing that dive in for more information, wondering what's going on with the neighbours in Saskatchewan." Some provinces searched for terms that seem like they'd be familiar to all of us: Canuck, Mountie, toonie, double-double. There are all kinds of possible reasons people look those words up, Bell says: "Canuck" is likely B.C. 's most searched term because it's the name of Vancouver's hockey team, she points out. People might be interested in the history of a word, or its context. Or there might be more practical considerations. "I'm sure that people in Saskatchewan know what a double-double is," Bell says. "They might be (asking), where's the closest place?" Other provinces are more inward-facing. Newfoundland's most popular phrase, "yes b'y" is Newfoundland-specific slang for an enthusiastic affirmation. And "the 6ix," Toronto's name for itself, might garner eye rolls in provinces outside of Ontario. "I'd be very surprised if people outside of the Toronto area are searching 'the 6ix," Bell says. Previous studies on Canadian regional slang had similar findings: Canada's size means many areas are relatively isolated, which allows for unique local expressions to flourish. A 2017 survey of 9,500 English-speaking Canadians conducted by The 10 and 3 found, for instance, that Newfoundlanders have their own term for what the rest of the country might call "cranky": if you're in a bad mood in Newfoundland, you might be described as "crooked." If you're west of Saskatchewan, you're mostly likely to call the schoolyard game of playing baseball with a soccer ball "kickball," while inhabitants of the provinces from Manitoba eastward likely call it "soccer baseball." One of the terms that varies the most by region is the one you use to describe a summer house: if you're in Manitoba or further west — or if you're in Newfoundland — you go out to the cabin. Ontarians either go to camp or to the cottage, depending on where they live in the province. Nova Scotians also go to the cottage, unless they're in Cape Breton, in which case they go to the bungalow. And Quebecers go to the chalet. Overall, Bell says the accessibility of the online world makes it easier for Canadians to understand one another. "The internet has really changed our ability to be able to be curious," she says. "Canadians like to reflect on ourselves, to understand different parts of our country." Oh, and for the record: "fill your boots" is a Western Canada saying that means, "Help yourself." You're welcome.